August 2017 – Narooma Rotary Club Inc. I am sorry that I will not be able to join you on Thursday evening to thank our Busking sponsors. The success of our Busking Competition was due to the hard work of our organising committee and the support of our sponsors. Business owners in our small community are often asked to support a myriad of events and activities, it is great that they have chosen to support the Busking Competition and it is fitting that we thank them with a special event. As mentioned elsewhere in the Beacon the Whale Watching Raffle will be drawn on Saturday. Thank you to members who sold tickets in various parts of the town, you help was greatly appreciated. The major fund raising project for our Club are the Narooma Rotary Markets. The Markets have provided in excess of $12000.00 a year that we donate to a variety of causes. It is important for us that the markets continue to grow and evolve, for this reason I believe that it is time to carry out a quick review of what we do and how we can make a very good activity even better. If you have any ideas or if you would like to be a part of the review let me know. 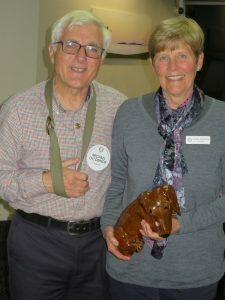 Just a reminder that our next ‘Rotarian Presents’ night will be at Narooma Dental Surgery on 7 September. Charmaine will fill us in on all things dental. Please be at the surgery at 6:00pm, we will head to the golf club afterwards for dinner and fellowship. Angie Ulrichsen proposed our international toast to the RC Amsterdam International in absentia via email; she was not well enough to join us at the meeting. Chris O’Brien and Angie had joined the Amsterdam Club International for dinner at the Hilton Hotel during their recent European jaunt. Being the summer holidays, the Club’s numbers were down from their normal 40, so those still in town are enjoying informal dinners each week. ‘They were a good bunch of about nine business people from various countries who call Amsterdam home for now,’ Angie said. ‘Chris and I described our Club activities, exchanged banners etc then enjoyed a yummy three-course dinner in the elegant Roberto’s restaurant. Fortunately one member gave us a lift back to our hotel which was on the other side of the city.’ The Club regularly has ambassadors as guests and has formal gala fundraising events. Expo coordinator Frank Eden reported from an earlier meeting that night that ‘things are shaping up well’ for the Expo. We are still seeking Expo sponsors and more exhibitors and finalising forum speakers. It will be at the Sport & Leisure Centre from 10am to 4pm. Member for Eden Monaro Dr Mike Kelly will open it in the morning. The Expo dinner will be in Club Narooma at 6pm (bookings essential) followed by a Forum with three keynote speakers followed by questions to a panel. Geoff works with the Southern Region Business Enterprise Centre (SRBEC), a regional organisation that delivers business and educational services across southern NSW and the ACT. He is SRBEC’s Bintrim Manager which means he helps businesses reduce waste which he said can reduce costs and save time. He spoke about innovative businesses that are finding new and profitable ways of using all kinds of waste materials, some of them locally. ‘Waste should be seen as a great resource,’ he said. More generally, he said regional development generally needs to focus on innovation of products, processes and organisations. Creating and appreciation of the local culture and environment is conducive to innovation and creativity. Geoff added that BEC is interested in being an exhibitor at the Expo because o its interest in recyclables. An interesting postscript, Geoff has been part of the Tilba Lake community since 1980. The whalewatching raffle will be drawn this Saturday 2 September at 12.30pm at Narooma Charters, Narooma Town Wharf. If you can, please be there to support this initiative. This raffle is raising funds to support Eurobodalla Surf Clubs, which is the joint fundraising effort by the three Eurobodalla Rotary Clubs for this year’s Rotary Christmas Races. This Thursday’s meeting will be a little different. We will meet a little earlier at 5.30 pm for an informal thank the sponsors’ night. It’s a partners night with drinks (first drink is free then you pay) and nibbles, probably in our normal Seahorse Room but please check the sign as you come in. If we have a huge response, we may be in the auditorium upstairs. Our Festival coordinator Sandra Doyle is keen for us all to circulate among our visitors who will also include representatives from the organisations that received donations from Festival proceeds. Please note dinner is not included in the meeting, but you are very welcome to buy your dinner around at the Club’s bistro after the sponsors function. This week’s Rotary Weekly has a great article about a new advertising campaign ‘People of Action’ to promote Rotary’s work. According to the article, many people have heard of Rotary but few actually understand what Rotary clubs do. In fact, 35% of the public is unfamiliar with any Rotary program including those of their local club. Click here to check out the article and the associated material. We will discuss how we can use this material at our next Board meeting. It has been a confronting week with another terrorist attack in Europe. Our thoughts and prayers are with all victims and their families. Fortunately Rotary as a world-wide organisation continues to work locally and internationally to promote peace and understanding. I’m sure the world would be a better place if more people understood Rotary’s work and commitment to ‘Service Above Self’. 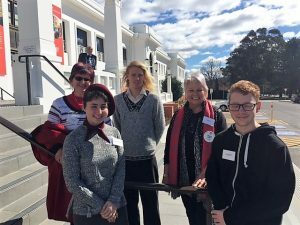 Narooma’s team representing France at MUNA at Old Parliament House in Canberra consisted of Narooma High Year 11 students Cyann Vlatovic (front left) and Isaak Anderson; Sandra Doyle (back left), Narooma teacher Lachlan Reilly and Lynda Ord. Another example of the good work of Rotary was last weekend’s Model United Nations Assembly (MUNA) in Canberra. MUNA helps our young people gain a better understanding of the world, the problems we face, and how to work together to solve them. A full report on the weekend is in this Beacon. Thank you to Sandra and Lynda for giving up their weekend to support our team from Narooma High. Last week we welcomed Angie back from her recent European jaunt (the Norwegian fjords was a highlight) as well as Iris (fresh from Germany), and it was good to have Julie with us again. Recent sad events in Charlottesville in the United States prompted President Bob to toast the Rotary Club of Charlottesville, the first of our now rostered international toasts. It is one of three Rotary Clubs in that city and meets every two weeks. Our guest speaker Tim Burke spoke about Healthy Art. Tim is well known for his music program on community radio 2EARFM each Tuesday night, his photography, and in recent years for staging various live shows at the Kinema and Golf Club. Before all this Tim was a master cabinet maker working with some of Sydney’s top builders. Then he decided he’d had enough of Sydney and commuting from Narooma and wanted to stay put here. Tim said he hadn’t prepared a talk but did have a slideshow. ‘My whole life is one big ad lib… Because of an injury I had to reinvent myself and by default ended up in the arts.’ His planned career in photography couldn’t happen, so his wife Fiona established Slightly Twisted Productions and he ‘ended up in this crazy world of music and the arts’. Now 30 shows later…. Tim Burke: ‘Rotary’s Busking Festival is a real celebration of ‘Healthy Art’. Tim did the sound and lighting for our Busking presentation at the Golf Club. He feels the Busking Festival is ‘so fantastic’, ‘people came from everywhere’, and is a real celebration of ‘Healthy Art’ and so inclusive. He said already the Festival is an important part of our community and urged Rotary to ‘protect it’. ‘an amazing time’. Over 70 students from 26 schools across the eastern states attended MUNA this year, including students from all five secondary schools in Eurobodalla Shire. 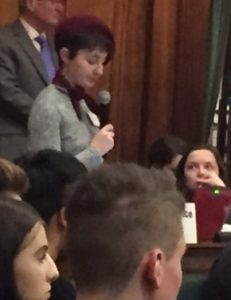 MUNA is an annual Rotary youth programme which provides students with the extraordinary experience of contributing to a United Nations General Assembly style debate in Old Parliament House, the aim being to increase international understanding and goodwill. This is the fourth year Narooma has fielded a team, thanks to the support and dedication of teacher Lachlan Reilly and our Rotarians Sandra Doyle and Lynda Ord. Each school team at MUNA represents a different nation and debates contemporary global issues from that country’s point of view. Narooma represented France. Year 11 students Cyann Vlatovic, Campbell Allison and Isaak Anderson put in a lot of work with their teacher, Sandra and Lynda over many lunchtimes before the weekend, to gainan understanding of France’s history, politics, economics and particular stance on world affairs. Sandra and Lynda said it was a fabulous weekend and a special thankyou goes to the organiser Garth Britton and his team from the Rotary Club of Canberra Sunrise for a very successful 21st MUNA. A reminder that Thursday next week is a ‘thankyou’ night for sponsors of the Busking Festival. More details tonight. August is Rotary Membership Month. 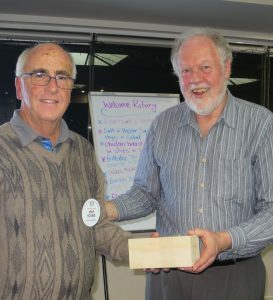 It is a time we should reflect on how we can build our membership base to ensure that Narooma Rotary continues to be a vibrant Club well into the future. One of the ideas the Board has been discussing is to promote the idea of associate or friends of Rotary membership. 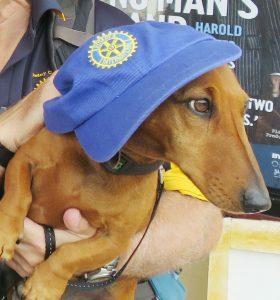 Rod Walker has been doing some research and has checked out what is happening at other clubs to promote the Friends of Rotary concept. Click here to see what is happening at the Rotary Club of Castle Hill, maybe we can implement a similar system at our Club. If you have any suggestions for potential Friends of Rotary please let a member of the Board know. 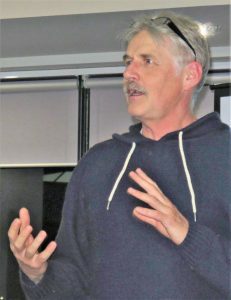 Invite Ron Finneran from the Sapphire Coast Arts & Sport Youth Development Fund (see below) to speak at our meeting on 14 September 2017 in lieu of a Club Assembly. Representatives of sporting, cultural and service clubs will be invited. The Board also discussed possibly allocating up to $2,000 per annum to the fund in there was agreement that such a fund was needed in the Narooma area. We will hold our Mad Hat night on Thursday 12 October with partners and friends. Details to come. Hold a Mad Hat night on 12 October during Mental Health Month in October to support Australian Rotary Health mental health projects. Provide a letter of support to the VRA in their attempts to raise funds for the purchase of a rapid response vehicle. It was an intimate gathering at last week’s Club Assembly with many still away. I think the Assembly only had an additional two members to the Board meeting. We’re looking forward to a return of at least two members this week. The Board meeting reminded us there is a lot of interesting and some fun things happening in coming months. Please stay tuned. We were sad to hear that Ruby Christmass has withdrawn from the Rotary Youth Exchange program, but look forward to seeing her involved in other Rotary programs in the future. Three Narooma High students are off to the Model United Nations Assembly (MUNA) in Canberra this weekend with Lynda Ord, Sandra Doyle and teacher Lachlan Reilly. The students will represent France and hope to visit the French Embassy on Friday morning before MUNA begins. What a great weekend it will be for them all. It will be a treat hearing back from them all. Please note that we have reintroduced the International Toast as an allocated duty each week. The Board would appreciate it if whoever is allocated that duty actually researches a club and tells us a bit about it. It may be from somewhere in the news, one visited overseas, or just a random choice. Bob mentioned the Sapphire Coast Arts and Sport Youth Development Fund. It supports local youth under 18 in pursuing their arts and sporting endeavours. * In its first year, the Fund gave out $12,000 in grants to 20 young people across Bega Valley Shire to pursue their passions which ranged from the viola to women’s rugby, swimming and stage production. The fund was started in September 2016 by Ron Finneran, Steve Goodchild and several others. It’s run by volunteers and funded by donations from businesses and individuals across the Shire with a contribution from Bega Valley Shire Council. Ron Finnernan has encouraged many across the Sapphire Coast to get behind the district’s talented youth by contributing to the fund. He said where they live is a long way for young people to travel for expert tuition and, while the Fund can’t always cover the entire costs, it can help out with fuel and travel costs. Ron will be our guest speaker on 14 September. As Bob mentioned, we are inviting other local clubs and sporting organisations to hear what Ron has to say and to see if people think such an organisation is warranted in our area. ShelterBox is no longer offering individual box sponsorship and tracking to donors. Reasons include the administrative cost of tracking and that they now supply other aid apart from ShelterBoxes. A note from ShelterBox says they will continue to deploy boxes when needed but can now supply a range of other aid to suit different conditions – tents ShelterKits to repair damaged homes or build emergency shelters, and a range of essential items like solar lights and water filters. Over the past year, Rotary clubs around the world have over US$2.8m to help more than 20,150 families who have lost everything following some disaster. The funds enabled deployments to disasters in Afghanistan, Cameroon, Columbia, Ecuador, Fiji, Haiti, Iraq, Mozambique, Niger, Paraguay, Peru, Sri Lanka and Syria. Disasters included floods, political conflict, landslides, earthquakes, hurricanes and cyclones. ShelterBox worked closely with Rotarians and Rotaractors to assess communities affected by flash floods and mudslides in Peru. As a result, 2,000 solar lights and mosquito nets along with 1000 ShelterKits were distributed. The ShelterKits allowed some families to stay in their homes and temporarily fix damaged structures while the nets and lights were used in camps by families who had lost their homes completely in the floods. Since October 2016, approximately 900,000 people have been displaced in Iraq as forces battled to retake Mosul. ShelterBox and partners, including the Agency for Technical Cooperation and Development (ACTED), have been helping people fleeing the city. Over 6,000 families have received shelter and other aid items, with a further 2,000 families receiving additional essential lifesaving items. ShelterBox continues to work with partners to reach more families. The whalewatching season is nearly upon us, so the date of the draw rapidly approaches – 2 September. We are again indebted to Narooma Charters for their support. Would everyone please bring in raffle tickets, sold or unsold. The Club has reduced the number of ‘raffles this year from three to two, in response to Members’ wishes. Funds raised in this raffle will go with those raised in conjunction with the Rotary Christmas Races on 24 December to support the Shire’s surf clubs. We need three or four of our members to help out at the Rotary Christmas races at Moruya on Sunday 24 December. Any volunteers? Last week Michael O’Connor spoke to us about his trek; Laurelle will report in more detail later in this edition of the Beacon. However, I am amazed and impressed that largely through the efforts of one member more than $12,000 has been raised for two worthy charities. Thank you, Michael. You have and are making a difference. Ruby Christmas, the Club’s successful Global Youth Exchange applicant has decided not to take up the offer. While it was disappointing to hear of Ruby’s decision she has made it for all the right reasons. Ruby is a fine young person and a wonderful ambassador for young people in the Narooma community and I wish her well. I am sure that we will hear great things about her in the future. As I mentioned at a previous meeting, the Club will host an event to thank the Narooma Busking Competition sponsors and supporters on Thursday 31 August at the Golf Club. This will be our opportunity to show our appreciation and hopefully lock in support for the 2018 competition. Planning is also well underway for our second Renewal Energy Expo on Saturday 25 November and will follow a similar format to last year. Great exhibitors and outstanding speakers are now being finalised. Please keep this date free as we will need the support of all members to make the Expo a great success as well as the market the following day. I came across an interesting article in the latest edition of the Rotary Weekly about Rotary Community Corps. Click here to find out more. It is another great example of Rotary Making a Difference. Michael’s wonderful support team of Donna and coach Murphy (representation thereof). It was good to see a few more partners at last week’s meeting to hear Michael talk about walking the Bibbulmun Track and everything associated with this marathon effort, including the amazing generosity of so many people along the way. He particularly mentioned his great appreciation of Charmaine and Bob Antill’s support from the outset. Real life Coach Murphy in action. His preparation included training under coach Murphy. He didn’t keep records but estimated he walked over 2,500km before he went, his pack initially stuffed with bricks progressing to sacks of rice. Another part of his preparation was the huge amount of work preparing and dehydrating his meals with the added complication of his food allergies. Meanwhile Donna and his son Christopher did a risk assessment of this undertaking… Michael still went. He started at Albany. The photos along the Track were impressive; the track itself goes through 20 national parks and is quite overgrown in places. His pack weighed a whopping 22kg. He got rid of a lot of his expensive gear along the way, replacing it with lighter, cheaper gear. He slept each night in a basic shelter located every 18-25km; sometimes he put his tent up inside to stop mosquitoes. ‘The worst part of the walk was the smell of my own perspiration,’ he said. Along the way he became ‘geographically misplaced’ a few times because track markers were either missing due to bushfires or difficult to see, the lens in his glasses broke, the zipper on his sleeping bag broke, and he twisted his ankle, but still he pushed on. When he injured his shoulder and his foot continued to be a problem (having walked on it for about 100km), he decided it was time to pull out when he had the chance. He had walked more than half way, about 560km. What we all came to appreciate, if we hadn’t already, was the huge physical, mental and emotional effort Michael’s undertaking involved. He also succeeded in raising over $12,000 for the Global Polio Eradication Initiative and for a school in the Kenyan village of Rangi, two projects dear to his heart. President Bob thanked Michael (and Murphy), acknowledging the immensity of his achievement. The wheel followed with a large number of prizes including many ‘sugar fixes’, too many prizes to list. 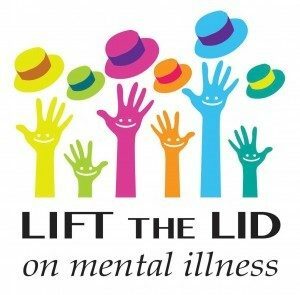 Australian Rotary Health (ARH) has recently introduced a new three-year fundraising campaign called Lift the Lid on Mental Illness. Funds raised will go towards more research focusing on preventing mental illness, particularly in our young people. ARH chairman elect Greg Ross reminds us that mental illness is the greatest health challenge facing our society today. He encourages Rotarians and the wider community to get involved during Mental Health Month in October, particularly focussing on World Mental Health Day on Tuesday 10 October. That’s when we’re encouraged to celebrate Hat Day by holding an event, wearing a hat and raising funds. The ARH Board has suggested other possible way to help raise funds, such as involving local coffee shops and Bunnings Warehouses, all of which we will no doubt explore. Our RI Director Noel Trevaskis urges us all to get involved with ‘this great initiative’. All donations are tax deductible. Australian Rotary Health is one of the largest private funders of mental health research in Australia. Subs are due: Just a gentle reminder for those still to pay their subs. Our treasurer is keen to sign off on this task. We’re looking forward to the safe return of our many absent members who are either overseas or in warmer climes. Be good to have them with us again.